It is hard to stay encouraged in any pursuit in life - simply because discouraging things come up against your efforts. I’ve found podcasting to be that way - IN SPADES! There seem to be so many things - from the rest of life to the technology hurdles - that make it hard to stay consistent and encouraged when it comes to keeping your show alive and the vision you first had for it front and center. That’s why I invited a podcasting veteran to be on the show today. And he’s not just a veteran, he’s like the Grand-Daddy-Grand-Poobah of podcasting. I’m talking about Rob Greenlee - a guy who was doing podcasting before it was podcasting. Seriously, you need to hear his story to see how that was even possible. It’s all on this episode. 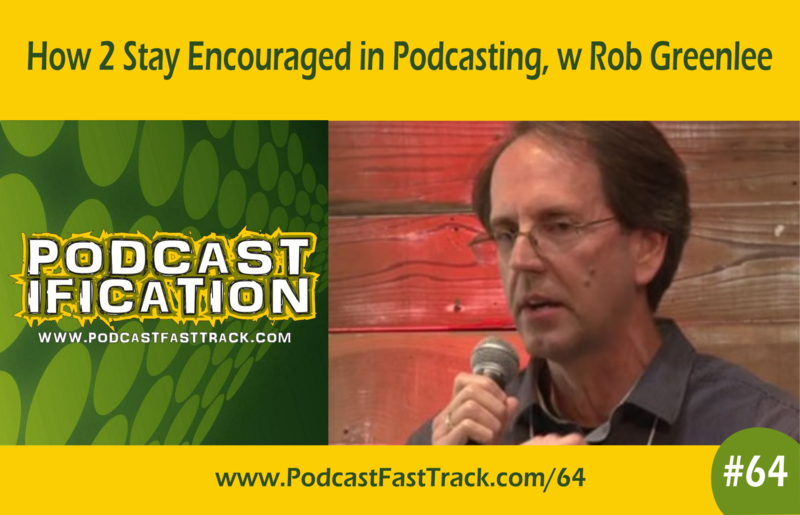 I want you to stay encouraged, because you have great things to publish on your podcast. On this episode of Podcastification, Rob Greenlee digs into the archives of his past to share some of the most discouraging and difficult things he faced in those early years - and he follows it up with sage advice for those of us who are coming behind him on the podcasting journey. His advice about how to stay encouraged is practical, down to earth, and stuff you can implement right away, so be sure you take the time to hear what he’s got to say. Rob’s track record proves that he truly cares about you being the success we all know you can be! How Microsoft shut down podcasting WAY before Apple came along. One of the most interesting little bits of trivia Rob Greenlee shared on this episode is a little-known fact about podcasting from the history of a mega-company that is not even remotely associated with podcasting today - Microsoft. Listen in to hear how Microsoft had all the technology in place to make podcasting simple and possible for the average person and then made the decision to pull the plug on it entirely. Oops! You’ll get a kick out of it - and learn a lesson or two from Rob along the lines of - where your mindset is, your actions will follow! [2:09] Rob’s experience with podcasting before it was podcasting. Yep. [5:36] How Rob’s passion for marketing led him to podcasting. [10:44] The obstacles and discouragement Rob faced and how he pushed through them. [13:41] How do you carve out the time to produce a quality podcast? [20:20] The things Rob has seen that most commonly sidetrack podcasters. [26:11] Rob’s role at Spreaker - and what Spreaker is. [28:34] Advice for fairly new podcasters to endure the slog. [31:43] How to determine if your podcast is bringing the ROI you want. [34:28] Why podcasting needs to be seen as a marathon, not a sprint.